Tag line: "Like Handel.. only funnier." As much as I love Holy Grail, I’ve always considered 1979’s Life of Brian to be Monty Python’s best film. Written by Python alum Eric Idle and conductor / composer John Du Prez, Not the Messiah: He’s a Very Naughty Boy is billed as a “musical oratorio” based on Life of Brian, and is an often funny, very entertaining, and quite unusual take on the story. Performed live at the Royal Albert Hall on October 23, 2009 (to commemorate the 40th Anniversary of Monty Python’s Flying Circus), Not the Messiah: He’s a Very Naughty Boy features Idle himself and a quartet of professional singers, all backed by the BBC Orchestra and chorus. A spoof of Handel’s Messiah oratorio, Not the Messiah re-tells the tale of Brian (a role played by Tenor William Ferguson), the son of a Jew named Mandy (Mezzo Rosalind Plowright) and a Roman soldier, who lived during the time of Christ. Born in a manger, Brian grew to adulthood, joined a revolutionary group (The People’s Front of Judea) led by an anti-Roman fanatic named Reg (Bass Christopher Purvis); fell in love with fellow militant Judith (Soprano Shannon Mercer), and, after being mistaken for the Messiah, was crucified as a traitor to Rome. With some of the other Pythons popping up occasionally, most notably Michael Palin (in drag), who acts as narrator, Not the Messiah combines a number of musical styles (Doo-wop, folk, classical, and even mariachi) to relate Brian’s story, taking us from the dawn of time (and the beginning of organized religion) through to a rendition of “Always Look on the Bright Side of Life”, easily the most popular Python song ever written. Though they play it straight, everyone on-stage is clearly enjoying themselves, as is the audience in attendance. All of the arrangements are good, but my favorites include “Chaos and Confusion” (the opening number, which gets things off to an exciting start), “What Have the Romans Ever Done for Us?” (the re-enactment of a very funny scene from the movie), “Individuals” (A Bob Dylan spoof, complete with harmonicas), and “The Final Song” (a melancholy tune in which Brian accepts his fate and prepares to die on the cross). 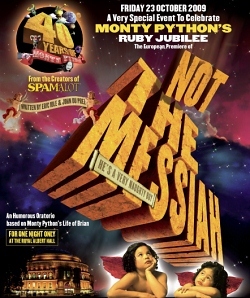 With Idle sometimes reciting lines of dialogue lifted directly from Life of Brian, as well as Michael Palin’s impromptu rendition of “The Lumberjack Song” (which also features Terry Gilliam, Terry Jones, Carol Cleveland and Neil Innes), Not the Messiah is a fun combination of old and new, taking what had been a hilarious motion picture and transforming it into a musical extravaganza.